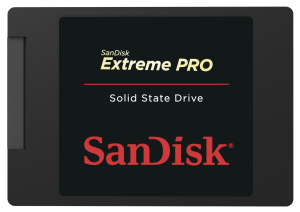 Today, CDRLabs brings you a review of SanDisk's new Extreme PRO solid state drive. Designed with gamers, enthusiasts and media professionals in mind, this high-performance SSD is powered by Marvell's 88SS9187 "Monet" controller and is equipped with SanDisk's new 1Ynm eX2 ABL MLC Toggle NAND flash to deliver up to 550 MB/s sequential read and 520 MB/s sequential write speeds. The Extreme PRO also features a tiered caching system which combines a sizeable DRAM cache with the latest developments in SanDisk's nCache Pro technology. To deliver consistent high performance, nCache Pro uses a large non-volatile SLC cache to accumulate small writes at high speed and then flushes them to the larger MLC sections of the NAND flash memory array.